I’ve always thought that the best bulalo in Tagaytay is located at one of the many fancy restaurants fronting the Taal Volcano. Boy, was I ever wrong! 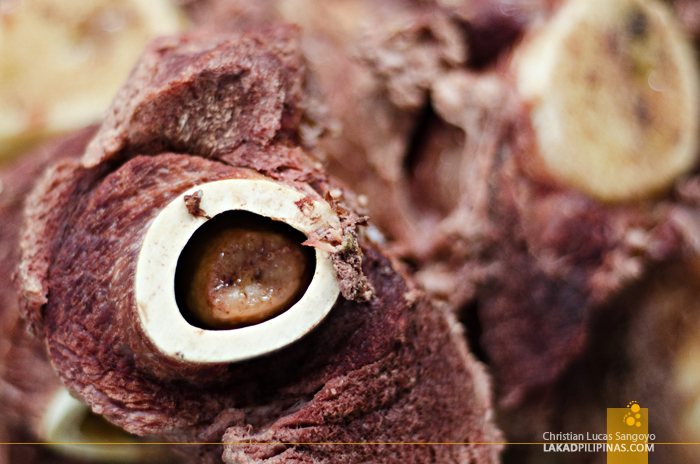 I’ve heard about the best bulalo being sold at one of Tagaytay’s many markets, but have no idea where it was. Little did I know that I’ve been passing through it countless of times, it was just at the Mahogany Market all along. Half a day of walking around the drizzly pathways of Caleruega made some dents on our tummies, immediately turning our mini tour into a Tagaytay food trip. We immediately headed towards the bulalohan area along the Nasugbu Highway to replenish our batteries but were immediately turned off by their prices (PHP380.00 per bowl). We packed up and boarded another jeepney, this time to Mahogany Market, there’s also a bulalohan strip there that’s much cheaper, although sans the view, my friend says to me. Vendors selling knives, kakanin and espasol immediately swarmed us as we entered Mahogany’s market ground. We bought a pack of pinipig and tried out a piece of espasol (free taste, the vendor told me); the knives, I wouldn’t have any use for, so we ignored those. The pinipig was great but the espasols wasn’t that particularly good, much to the seller’s chagrin. 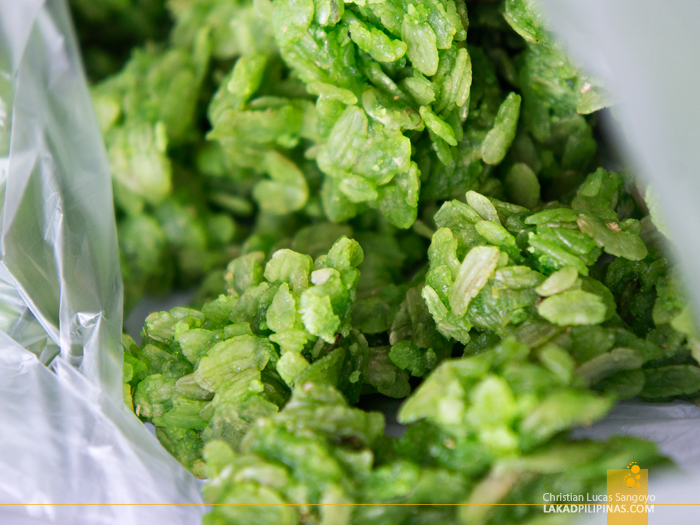 Even with the multitude of carinderia stalls lining the bulalohan strip at Mahogany Market, the place was still packed to brimming. Although we would’ve preferred to eat at the bulalohan with the most number of customers—a good indication that the place is really good—we had to settle for the least occupied one since there really were too many people lining up for a bowl of that sinful bone marrow soup. 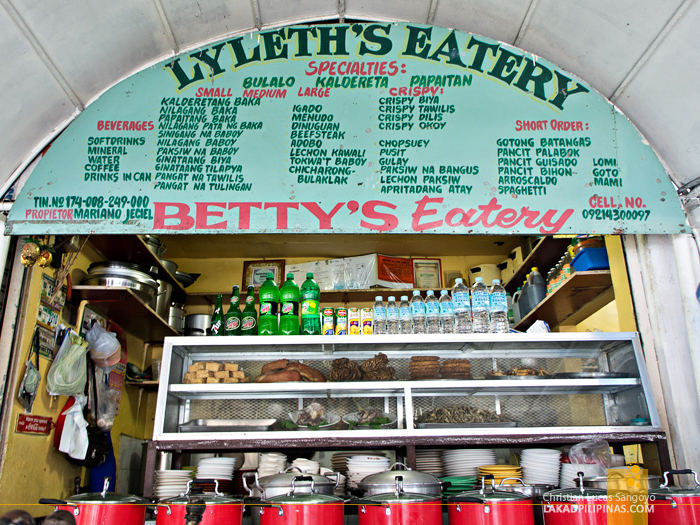 We finally settled at Lyleth’s / Betty’s Eatery. Well, we were having a hard time knowing the real name of this carinderia since they have two posted on their boards. It looks about the same as with the other eateries along the strip; but the important thing was they have bulalo and they allowed us to haggle with them. 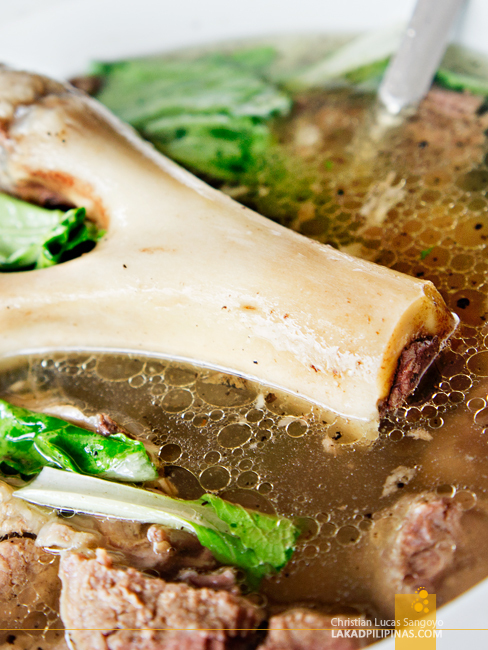 A bowl of bulalo cost PHP350.00, that’s good enough for three to four persons. But since there’s only two of us, we asked if we can have a customized order, they lowered the price down to PHP200.00 but without a bone. We begged, and they let us have a one. I now officially love this eatery! The bulalo was nothing short of spectacular. I haven’t had bulalo like it ever. The serving size was absolutely magnanimous. The meat was meltingly tender. The soup was the ultimate. And the bone marrow, an absolute killer. And I really mean that. 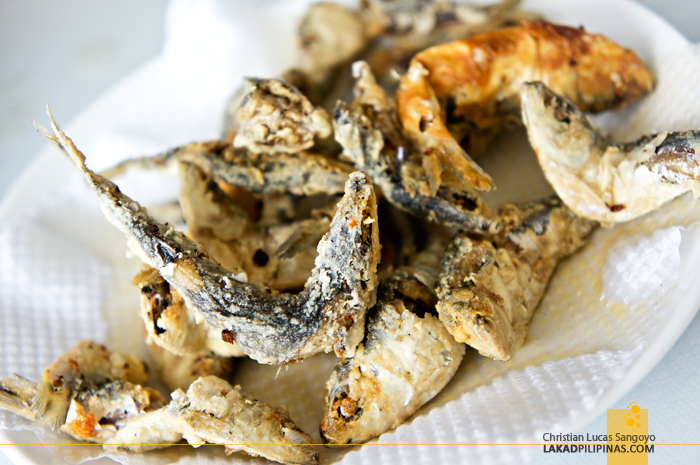 As if the huge bowl of bulalo wasn’t enough, we ordered a plate of crispy tawilis—a Taal Lake delicacy. It cost PHP100.00 but we asked if they serve half. They do, and it was awesome! You have to eat this like a chicharon, hold one end, dip it down their home made sweet/sour vinegar and bite down to the end (head and all). It was so crispy, I love it like I love chicharon! After miraculously wolfing everything down, we took a breather and ordered two cups of coffee. Funny thing was, I saw one of their staff mixing pinipig with their coffee. Aha. We just have to do that too! So we went ahead and poured some into our instants. The trick, ate said was to let the coffee make the pinipig really soft, then you spoon it like cereals. Unfortunately, I didn’t like it that much haha. 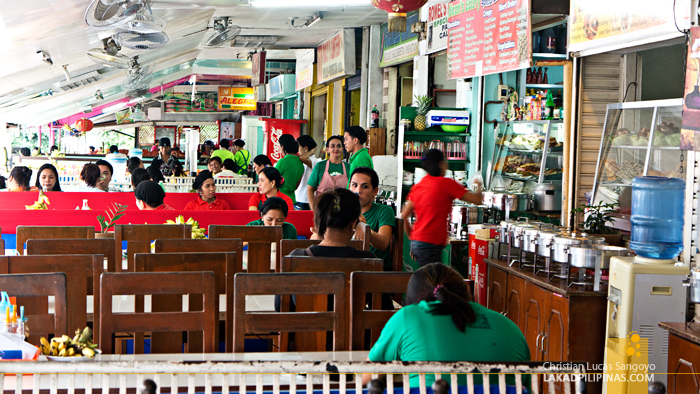 While having coffee, I asked what gotong Batangas was as I kept seeing it on food stalls along the highway. She said they have one and they can serve us a bowl of it if we still can eat. A serving cost PHP100.00 and we asked if we can have half. Surely, she said. And we were then served with the strangest goto I’ve ever seen. It has no rice pudding and it was filled with all sorts of innards! The soup was (again) really good and absolutely sinful! We tried a few spoonfuls before finally giving up; we didn’t want to have a heart attack on our way back to Manila! Before getting up, we munched on a couple of bananas which are given free to customers to probably compensate for their now clogged arteries. I don’t like bananas that much, but I took a few bites just to be on the safe side. I’ve been eating bulalo in Tagaytay for the longest time and I can say that it’s only now that I’ve tasted what a real Tagaytay Bulalo is. The bulalohan at Mahogany Market may not have the best amenities and may not be as posh as the restaurants near the highway, but I can truly say that the best bulalo in Tagaytay doesn’t need to have a view of the famous Taal Volcano. You won’t need any of those superficialities here anyways. 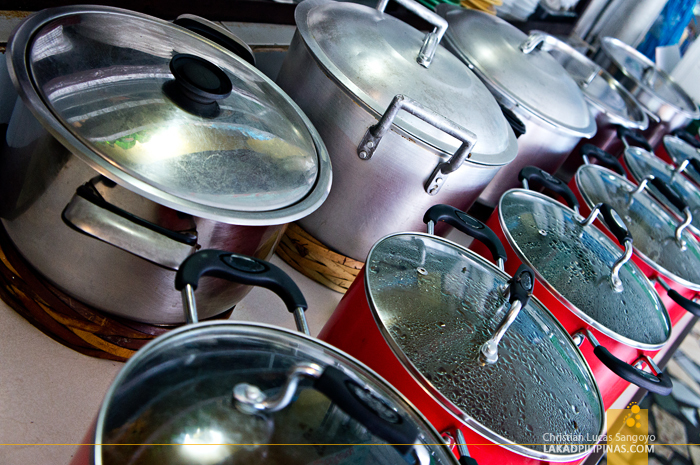 At Mahogany Market, it’s gonna be only you and your steaming bowl of bulalo. I recently went back with the usual suspects at Mahogany Market. What we went here for was, of course, another dose of bulalo goodness. The first few times we went back, the market’s bulaluhan remained exactly the same, but this last time, I was surprised to find that the usual stalls have disappeared. I was stricken, at first, but we found it has simply transferred to a much better location. It’s still within Mahogany Market’s compound, on the second floor of a new (I think) building a few steps away from its old location. We quickly looked for our favorite bulaluhan, Lyleth’s and thankfully, they moved with the other bulalo houses. Wanting to introduce a few of my friends to the best bulalo in Tagaytay, we asked for our usual pair of bulalo and tawilis. 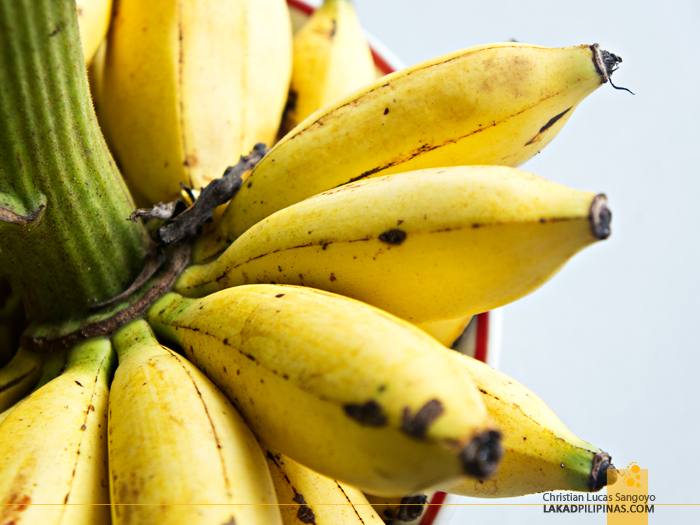 The price was still the same, there’s still free banana, and more importantly, it was still its simple but flavorful self. New location, same good ol’ Tagaytay bulalo. anong oras po nagsasara yung mga kainan sa mahogany market? thank you. Sino po nakakaalam pano mag commute from pasay to mahogany? WOW! this blog is suuuuper helpful (plus, it's HONEST :) ). 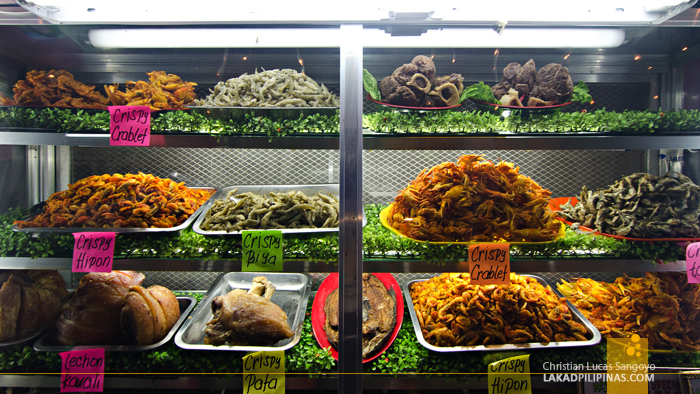 We will surely visit Mahogany Market when we visit Tagaytay. Hi. How to go there kung mag commute po? Galing kayo saan if ever? If nasa Tagaytay na kayo, kapag nasa Olivarez Plaza kayo, sakay lang kayo ng any bus na may signage na NASUGBU/ALFONSO/MENDEZ and sabihin sa konduktor na sa bababa kayo sa Mahogany Market. Kita-kits!!! Hi po, what if galing po sa sky ranch mam? Pano po kme makakapunta jan and how much po ang pamasahe? Sorry for the late reply, were you able to check if they were indeed open on December 26? Haha, salamat Reye! 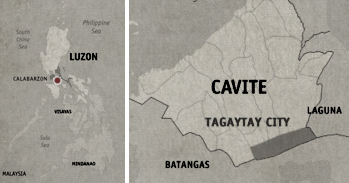 Nag-bulalo kayo sa Tagaytay? How much is the transpo from caleruega to mahogany market? and ano po sasakyan and landmark? I think around PHP10.00 or so, tell the driver to drop you off at Mahogany Market, they all know where that is. wow this is very timely! I'm on my way to Tagaytay with my family tomorrow I will surely dropby:) I wonder if they accept Senior Citizen discount here..
Hi Reina, how was it? Did they accept the senior discount for the bulalo? 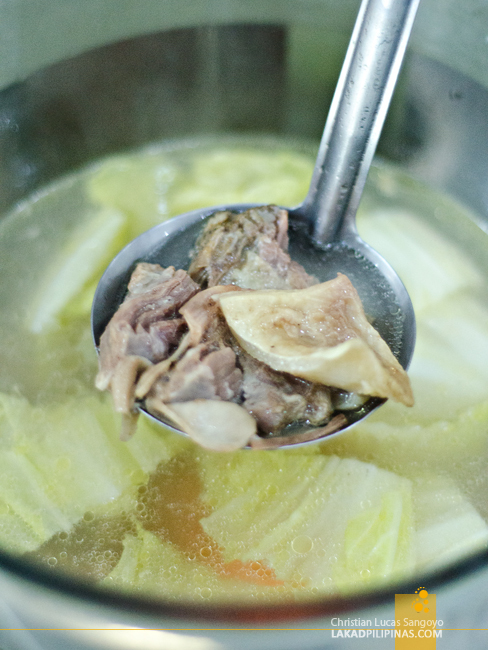 This blog should be blocked... as it's blocking my arteries with the mere photo and description of that yummy bulalo!!! haha But thank you for the post. Will be there this New Year weekend....sana bukas kayo. hehe See you soon Lylhet's/Betty's!!! Haha Sheila! 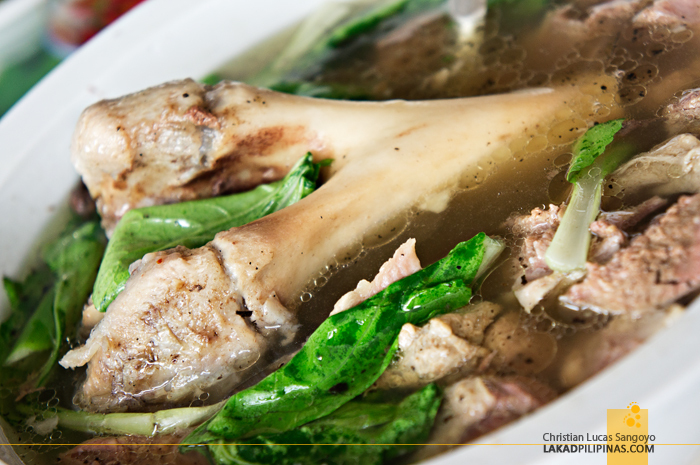 Enjoy Tagaytay's best bulalo! Thanks! 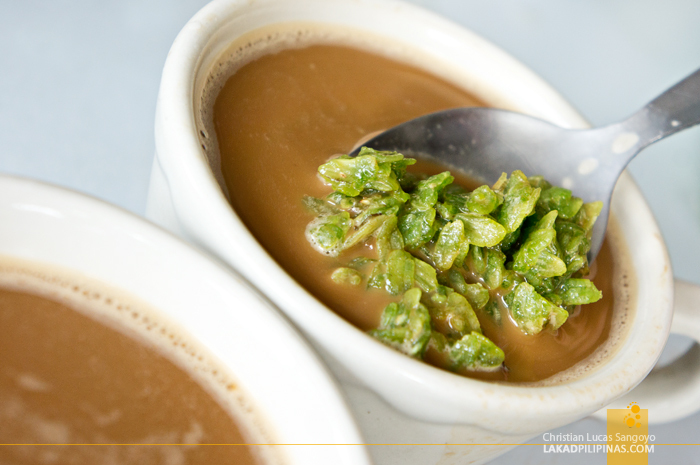 Enjoy the best bulalo in Tagaytay! Paano po pumunta sa mahogany market from calaruega church? From Caleruega, ride a bus bound for Manila, it will pass along Mahogany Market. Glad you find Mahogany Market's bulalo to be really good. 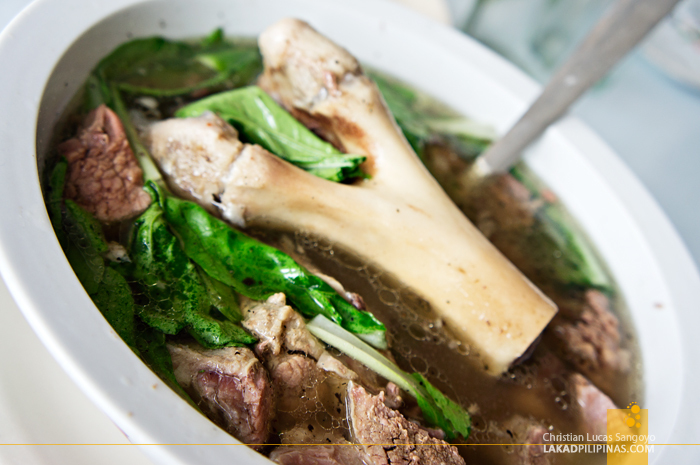 Could you say that it's really the best bulalo in Tagaytay? And we're you also able to try their tawilis? It's quite excellent too! Yes, buses from Manila passes directly along Mahogany Market. Just tell the driver to drop you off. Hello! 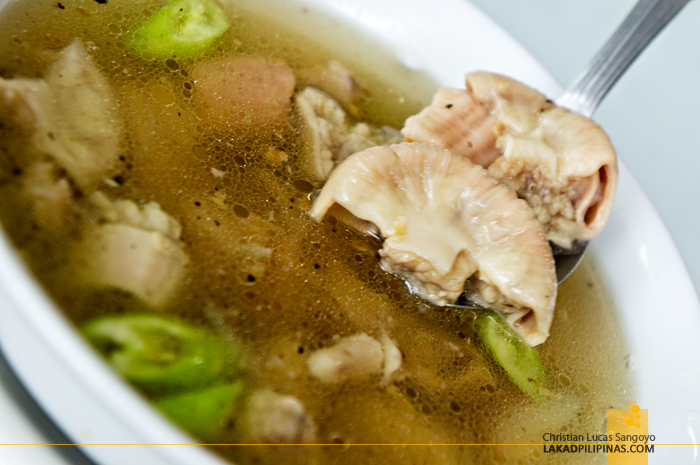 Would you know kung nagseserve po sila ng Batangas Lomi sa Mahogany Market? Planning to go to Tagaytay with friends and they want to try Batangas Lomi. Thank you! Lucky you! I really miss the bulalo at Mahogany Market! pag akyat nyo sa hagdan sa left side. currently dining here. its good na hindi sya masebo. bulalo is 350 just request for a softer meat. 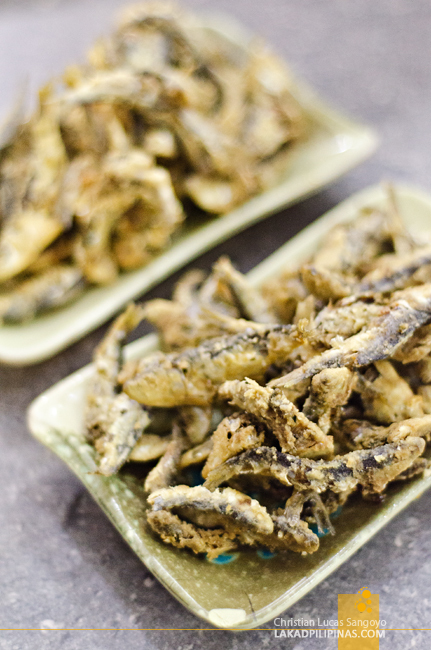 crispy baby tawilis is good for P200. Waaah ita try talaga namin ang bulalo dyan first time namin .. pag mula po ba sa manila pwede na kami bumaba ng mahogany market? or Olivarez po talaga muna ? May discount po kaya sila sa senior citizen hehe? Gud eve...thanks for this blog! Indeed, katakam talaga Bulalo sa Mahogany Market! 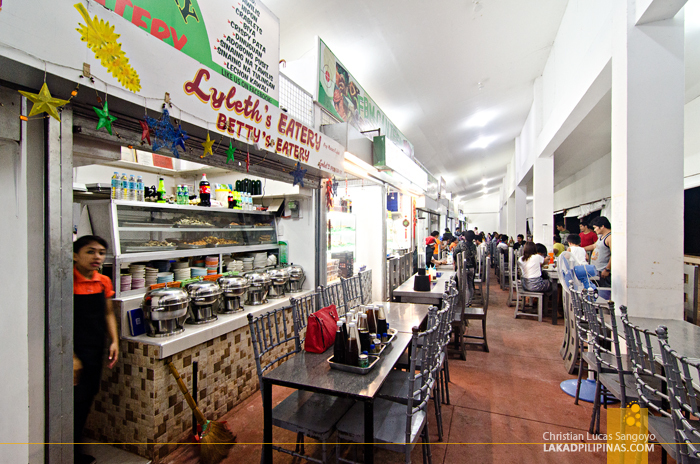 Have you tried other stalls besides Lileth's before?